One of our comrads across the sound, Andrew Maclachlan from U.S. Fish and Wildlife Service in Rhode Island, recently constructed a poster for a USFWS workshop held in February 2011. He had asked to use some of our photos to enhance the poster, and we were glad to help out! 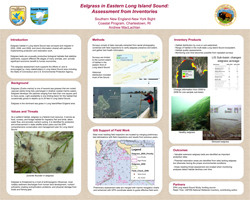 Andrew's poster explained the value of eelgrass and the methodology of recent eelgrass surveying in eastern Long Island Sound, including along Long Island's north shore. Eelgrass was deliniated from 2009 aerial photography and ground-truthed using a drop camera. 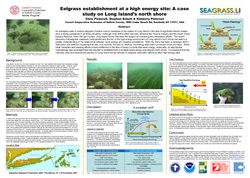 This results in the most current eelgrass distribution information for Eastern Long Island Sound. This information is then compared to past results to identify changes in coverage. Threatened meadows and potential restoration sites are also identified. In order to test out our new method of planting eelgrass in high energy environments, we set up an experiment. We wanted to determine if the size and dimensions of the rock serving as an anchor to eelgrass plantings was important for success in establishing the planting. Each of the 120 rocks were labeled, weighed, and measured, and two different densities of plants were placed beneath them (5 or 10 plants per rock). The experiment was repeated, once in late spring and once in fall to test for varience between planting seasons. The experiment itself was actually so successful that we were unable to locate many of the rocks the following season because the plantings not only established, but they accreted large amounts of sand, completely burying the rocks. We determined that the larger the rock, the better. In 2004 and 2005, we conducted research on the predation of eelgrass seeds by flat-clawed hermit crabs (Pagurus pollicaris). This species was first observed in the field possibly consuming seeds during the natural seed release season, raising concern that it might have an impact on seeding efforts. Rather than conduct a field project, it was decided that we would undertake this research in the controlled conditions of our greenhouse. The crabs were separated into large tubs with fine sand which had been sieved through a 1mm mesh. In between their regular feedings, they were exposed to varying numbers of eelgrass seeds. At the end of the trial period in which the crabs were exposed to the seeds, the sand was re-sieved through the 1mm mesh to separate any remaining seeds or seed coats. 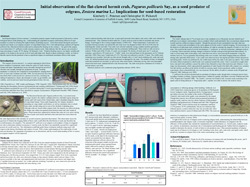 From here, the percent of seeds predated was calculated, and different treatments were compared. Our results found that the crabs not only consumed the seeds, but some some crabs consumed them at an extremely fast rate. As time permits, we plan to experiment with other potential seed predators. This research will hopefully give ourselves and other eelgrass restoration programs a better idea of the expected loss of seeds due to predation in areas where crabs are plentiful, which includes many of our restoration sites. Furthermore, we hope these experiments result in a more accurate approach to seed density requirements in order to successfully create an eelgrass meadow. 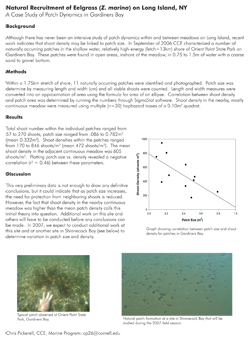 A preliminary study on eelgrass patch size in relation to shoot density was conducted in 2006, off of Orient State Park, Gardener's Bay.